As the exchange between its title character and Maui indicates, Moana fits into the tradition of the Disney princess movie in which a young woman must set out on an adventure and overcome her fears, with plenty of singing and animated dancing along the way. It helps that the songs in question come from Lin-Manuel Miranda, who wrote them around the same time that he was finalizing a certain Broadway show called Hamilton. Some aren’t that different in their general tone and purpose from Alan Menken’s work for Disney over the last few decades, but Miranda does have fun with two numbers in particular. “You’re Welcome” is a dizzy, busy, exuberant number that serves as a good comic vehicle for former pro wrestler (and half-seriously-proposed presidential candidate) Dwayne Johnson, while “Shiny” plays on singer Jemaine Clement’s former career as a parody songwriter with a mean impression of David Bowie. As for Cravalho, I’m more curious to see what she’s like as a live performer after her impressive delivery of “How Far I’ll Go” at the 2017 Oscars, where she kept her poise even after taking a hit to the head from a flag carried by a backup dancer. Her Moana isn’t nearly so unflappable, and it’s frankly rather wearying after a little while; it seems as though half of her dialogue is composed of nervous interjections, meant to hit us over the head with the idea that she’s just an ordinary, insecure girl thrust into extraordinary circumstances. She’s much more effective in the moments when the movie stops trying to limit her and instead lets her voice soar. 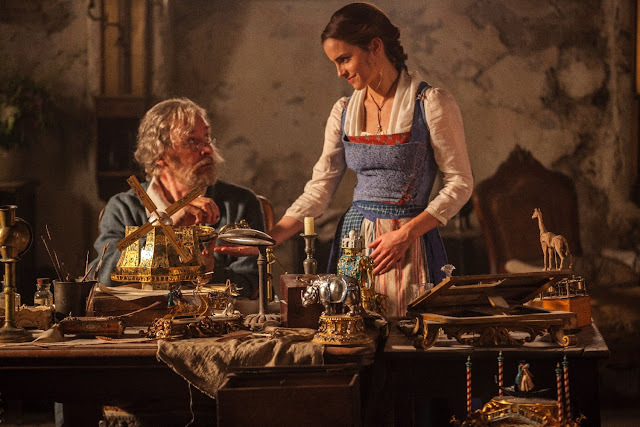 Kevin Kline and Emma Watson in Beauty and the Beast. Speaking of voices soaring, the 2017 remake of Disney’s Beauty and the Beast doesn’t do leading lady Emma Watson any favors by inviting viewers/listeners to compare her capable but underwhelming singing note-for-note with Paige O’Hara in the original animated film, whose 1991 release date apparently now confers upon it the status of a venerable “classic” (if that word can be said to have meaning anymore). If Moana often works as a refreshing, if predictable, update of the traditional Disney formula, Beauty and the Beast’s raison d'être isn’t as immediately apparent, and the fact that it’s part of a wave of forthcoming live-action remakes of movies like The Little Mermaid and Aladdin would normally suggest the sort of creative bankruptcy that caused Spielberg and Lucas to wring their hands over the industry’s future in 2013. However, it’s a testament to director Bill Condon, his cast, and the movie’s design team that it never feels like a completely empty cash grab. Visually speaking, the film operates on the premise that more is more, but, as with Kenneth Branagh’s delightful live-action version of Cinderella, it mostly works. There’s also some visual wit to it, including a moment in which Belle’s inventor father, Maurice (Kevin Kline, who’s as compulsively watchable as ever) quizzically stares at a sculpted arm holding a torch, an apparent nod to Jean Cocteau’s incredible 1946 version of the tale. Granted, the film’s an odd mixture of slavish adherence to the original and sometimes superfluous additions that receive much more emphasis than they merit. There are grim and rather tedious backstories that explain how Belle and Maurice came to reside in a provincial French backwater and how Dan Stevens’s Beast became a figurative as well as literal monster, as well as a number of instantly forgettable new songs that don’t make much of an impression. Much has been made of the fact that Josh Gad’s sidekick character, LeFou, is gay, but the change, while welcome, adds less to the movie than it does to the cultural conversation around it. But Luke Evans acquits himself well as the villainous Gaston, and he’s assisted by the fact that he has something of an actual character arc to work with this time. Meanwhile,the Beast’s servants, who have been magically transformed into household objects, get a sequence full of genuinely moving pathos right before the inevitable happy ending. Those characters are composed of a veritable who’s who of talented actors (Emma Thompson stands out), although they’re effectively only utilized as voice actors until the finale. Miss Fritter (voiced by Lea DeLaria) and Lightning McQueen (voiced by Owen Wilson) in Cars 3. If Moana feels like an update of an old formula and Beauty and the Beast justifies its seemingly pointless existence through its sense of style, Cars 3 falls into the more familiar territory of the sequel. The second movie in the franchise is generally seen as Pixar’s worst film, an apparent result of its creative team’s uncertainty over how to deal with the death of Paul Newman, who played a crucial supporting character in the original Cars. In this regard, the third movie feels like a do-over, as it follows the same basic structure as the first: anthropomorphized racecar Lightning McQueen, seeking an edge over his competition, goes through a series of learning experiences that will supposedly help him achieve success on the track. As with Beauty and the Beast, it’s chock-full of well-known actors lending their voice talents, including newcomers such as Nathan Fillion, Chris Cooper and esteemed character actress Margo Martindale. However, Cars 3 turns into something slightly different and far more interesting in its final act. You see the big plot twist coming from a mile away, but when it comes, it’s still welcome, taking us into territory that feels like Toy Story 3 lite. It also gives Cristela Alonzo, who plays Lightning’s new trainer Cruz Ramirez with infectious exuberance, some added dimension. Although Cars 3 eventually stops circling the same old track and goes somewhere different, it also had the weakest box office performance of these three movies, with Moana landing in similar territory and Beauty and the Beast far outstripping both. While financial receipts might seem unimportant in assessing a work’s artistic value, they’re worth considering because they provide at least a hint at how Disney’s strategy of producing consistently solid, if only mildly adventurous, fare might lead, with all that that entails for the future of cinema. Well executed as Condon’s film is, it’s also arguably the least inventive of these movies. Other Disney-owned franchises, such as the Marvel films, have started to feel grindingly repetitive, even when their focus-group-tested style remains broadly appealing. Even Episode VII of Star Wars drew comment for the unmistakable parallels between its structure and that of George Lucas’s original film; future installments will show whether this was intended as homage to the source material or a sign that corporate caution is leading to the creation of what are essentially carbon copies of that material. If it sometimes seems like the big Hollywood studios are spinning their creative wheels, films like Moana, Beauty and the Beast, and Cars 3 collectively show that that state of affairs need not mean we can’t find enjoyment in their familiar formula. It’s what will happen when that formula isn’t executed with as deft of a touch that should give us cause for concern in the future.